The new terrorism threat level will "not make any difference to daily life" for the vast majority of Australians but will mean "more security" at airports, ports, military bases, public buildings and large public events, including the upcoming AFL Grand Finals. But "football fans should not be deterred from attending the games..." Acting Australian Federal Police Commissioner Andrew Colvin: "You may expect to see heightened police presence but it won't be intrusive, I'm sure..."
Irvine of ASIO: "The rhetoric that is now coming out of the Middle East which is encouraging Australians to take violent action … increases the possibility of attacks here, and so we see an increase particularly in intent.. It could manifest itself in a Bali-type attack or it could manifest itself in the various other sorts of attacks from loners through to small groups to large activities..."
60 to 70 Australians are among the 10,000 foreign fighters fighting alongside the terrorists in Iraq and Syria and some had already returned home. 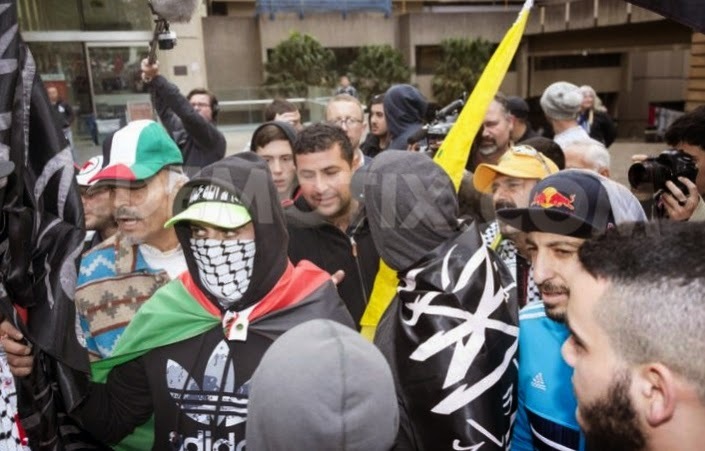 A report in Wednesday's The Australian says Australian security authorities are "concerned about a handful of Muslim extremists, operating in groups of three or four, who have broken away from mainstream mosques and the broader Islamic community." That same Wednesday, two days ago, some 180 officers from the AFP and Queensland Police swooped on nine properties across Brisbane in the northern Australian state of Queensland, among them an Islamic bookshop - the Iqraa Islamic Centre - in Brisbane, arresting two men. Both were charged with terrorism-related offences. A television news reporter [here] says one of the two is the brother of Australia's first Islamist human bomb (though he used the inaccurate and unfortunate term "suicide bomber"). He was referring to Omar Succarieh, the brother of Ahmed Succarieh who in September 2013 drove a truck laden with several tonnes of explosives into an army installation at the Deir al-Zour military airport in in northeast Syria. 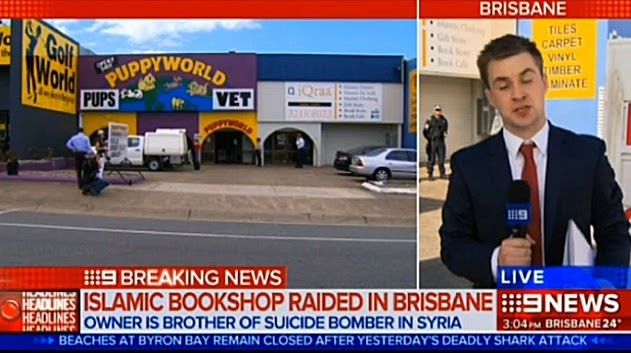 The bomber was named on social media sites at the time as "Abu Asma al-Australi", an alias that the media speculated "could refer to a Brisbane man named Ahmed" [video here]. All that was said at the time was that he "is understood to have a wife, at least one brother, and possibly a child." Australians' natural but misplaced sense of distance and relative security will likely have been reinforced by the video images of the raided premises given the prominent signs on the facade of the two shopping-strip neighbours [screen shot above; source]. This is a pity because - as the references to Bali and other unmentioned terror attacks indicate - Australia has paid heavily in this ongoing war already.